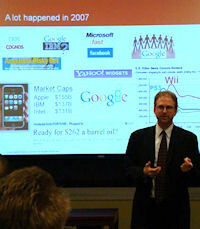 The audience consisted of about 70 graduate students in UVa’s MS MIT program and about 30 members of UVa’s Center for the Management of Information Technology. We were fortunate to be one of the first groups to present in the newly remodeled, state-of-the-art facilities in Rouss-Robertson Halls. I’ll give a brief recounting of each presentation, but I’m hoping that soon I will be able to edit this post to add links to videos of the presentations (3/17 update: it turns out the videos can’t be released – sorry about that). 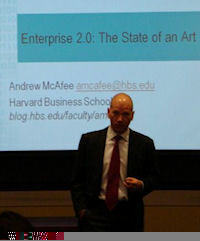 Andrew McAfee led off with a great 60-minute summary of Enterprise 2.0 and it’s implication for enterprise technologists. I’ll briefly mention two points he made that I thought were intriguing. The first was his discussion of the underlying trends of E2.0 which included “lack of up-front structure” and “mechanisms to let structure emerge”. Those two trends align with the “freeform” and “emergence” concepts that Dion Hinchcliffe added in his FLATNESSES checklist – which is an extension of Andrew’s original SLATES checklist. We discussed it briefly over lunch, and the E2.0 trends that Andrew is encountering are congruent with what we have been seeing. The other interesting idea Andrew introduced centered around the value of weak ties in a social network. He mentioned Mark Granovetter’s The Strength of Weak Ties from 35 years ago and the Web as platform for social network is reproving how accurate Marks isights continue to be. He postulated – and I agree – that the people with whom we have weak social ties may be more valuable than the people with whom we have strong ties. That idea supports the research I have been doing about the importance of diverse and inclusive groups as the greatest driver of innovation. Lewis Shepherd gave a great capstone presentation that illustrated the practical application of the ideals and theories covered earlier in the day. His perspective was that of someone who came to DC from Silicon Valley after 9/11 to help devise ways for the US intelligence community to better gather, share and collaborate on various intelligence sources. 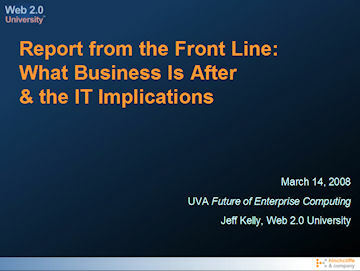 So, much of his presentation focused on implementing Enterprise 2.0 platforms in a ultra-secure environment. 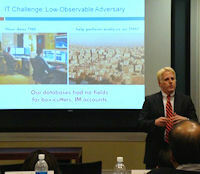 His insights were excellent and provide great fodder for countering security-veiled resistance to E2.0. (It gives us the ability to say, “well I’m sure the information sharing your employees will do does require the most robust security available – let me tell you how the US intelligence community uses to wikis to share top-secret information…”). 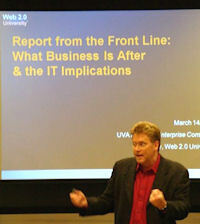 Lewis walked us through the evolution and success of Intellipedia as well as covering some other federal E2.0 projects. He also pointed out that my alma mater, EPA, is doing some great Web 2.0 work at epa.wik.is. I encourage you to read the EPA Web 2.0 Whitepaper – grand kudos to Brand Niemann and everyone else who is finally getting EPA to the level of public data exchange the Myles Morse and I (and many others) were hoping for 14 years ago when we worked on Enviro$en$e. The day wrapped up with a panel moderated by Stefano Grazioli where Lewis, Paul, and I (Andrew had an early flight) fielded questions. The entire day was a great learning opportunity and I look forward to delving deeper into the wealth of information that was presented. Thanks much to Brian Weston for posting pictures from the event! Congratulations on sharing the stage with the godfather of Enterprise 2.0, Andrew McAfee. He always has something interesting to say, as do you of course. Welcome to the blogging world. It’s good to have you here.